A year or two ago I mentioned to the SxBRC & Adastra that I'd like to do a shieldbug atlas for Sussex. Something like what Shropshire has produced. Having no time or coding abilities, that's as far as I got. 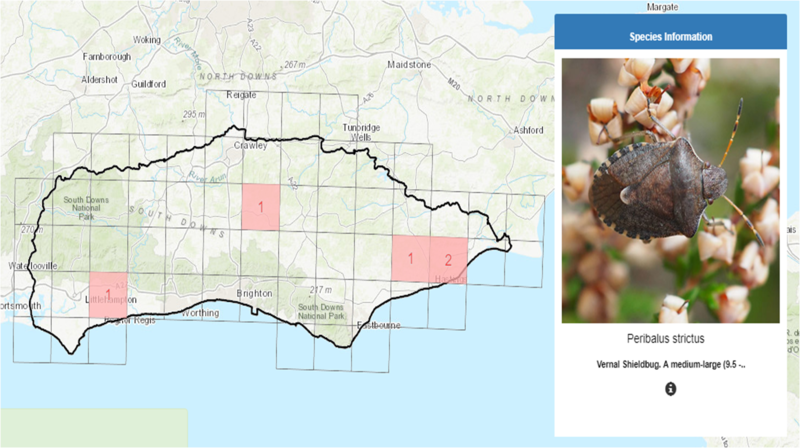 Before I knew it, volunteer Mark Robey had created (with Bob's help at the SxBRC) an online atlas. 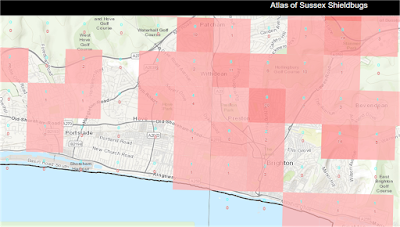 So with a few photos from myself and Derek Binns, a few lines of text from me and some minor tweaking of the look of the thing, SxBRC have launched the online atlas. (I know it was MUCH more work than that but I was impressed at how quickly the test version appeared). 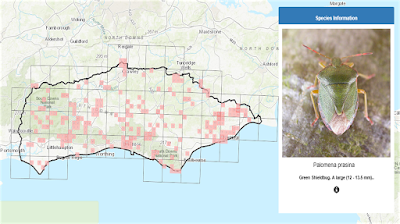 The site can be found here https://www.sxbrc.org.uk/shieldbugs/mapping.html. So many thanks to all of you have been submitting records via iRecord, they're all in there already so you can look around the map and find your records. As well as gaps in recording effort. It includes all the shield bugs, squash bugs, rhopalid bugs and the other usual suspects (such as Fire Bug). You can start off by displaying all records across all of Sussex and see where the hot spots are and where the gaps are. 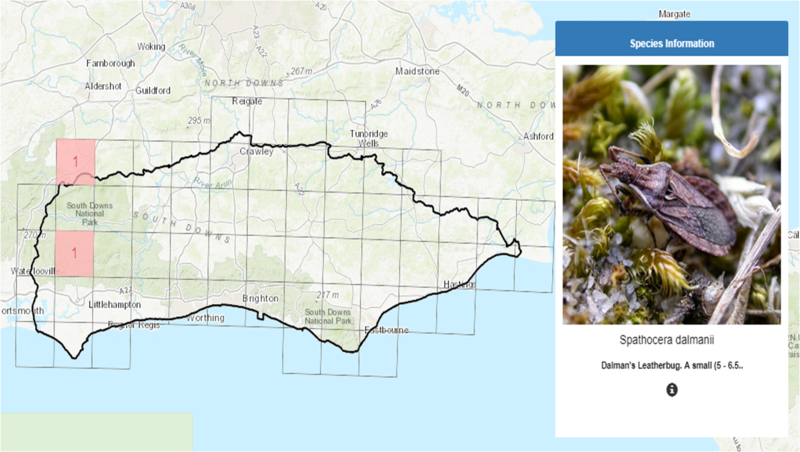 Here for example is the 1 km square I live in with eight records of six species. And if you click on that square the species list for the square pops up. I was looking around for the most well recorded square. It looks like this one has 145 records of 21 species! Here they are. Including the incredible Scarlet Shieldbug Eurydema dominulus. I would love to see that. I think this square must have something to do with Patrick Roper. 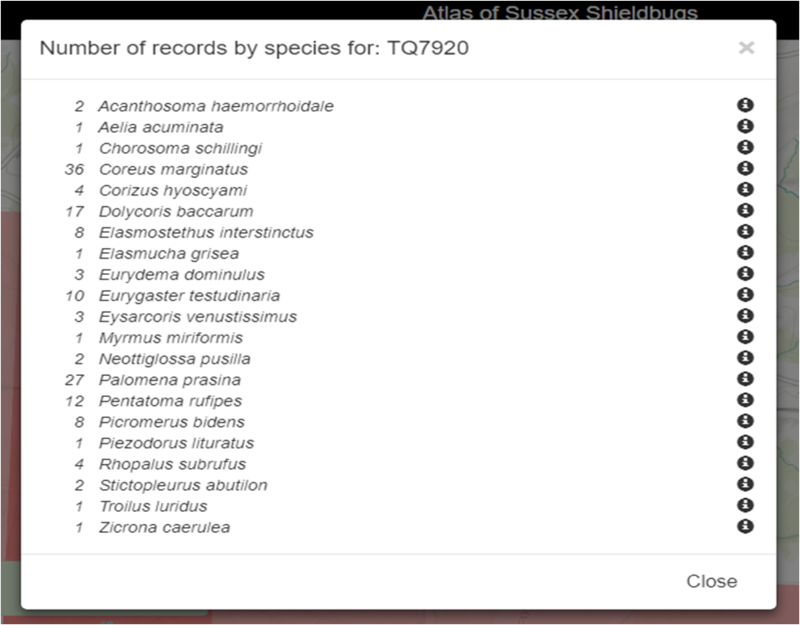 Now if you click on the species list from the drop down menu at the top left, you can focus in on individual species. Such as the Green Shieldbug here, perhaps the commonest species. Frustratingly I have just noticed that these images have squashed up a bit (that's why they're called squash bugs ha ha) but I haven't got time to change that right now. It gives you an idea anyway. You can change the scale. And if you click on the 'i' button some more text about the species, where you can find it in Sussex (or where it's likely to turn up if it's not yet in Sussex) and how you might find it. Here is a scarcer species. I put this in as there is already a new dot on the map but it was great to be able to instantly know it was the third county record and the most easterly one too, a great benefit of having an atlas. An attendee on a heathland invertebrate training I ran at the RSPB found Dalmann's Leatherbug Spathocera dalmani at it's most easterly site in Sussex at Wiggonholt Common. SxBRC will update the records at regular intervals so the records are as up to date is practical. Given that I haven't even entered this record into my copy of Recorder 6 yet, it's not going to be for a while! And here is the individual. Only seen this three times now. Once in Hampshire and once in Dorset so this was the first Sussex one for me and only the third Sussex record. Is it slowly spreading east? And I leave you with the map of a species I am yet to see, the Vernal Shieldbug. Tantalising stuff! A massive thank you to Mark Robey, Bob Foreman, Clare Blencowe and Derek Binns as well as Pete Boardman from Shropshire and Tristan Bantock for being inspirations. Now Agents of S.H.I.E.L.D.B.U.G.S., get out there and fill those gaps in!!! This is a difficult post to write but a couple of weeks ago I handed my notice in at Sussex Wildlife Trust. Being an awkward git who never does anything conventionally though, I plan to work a ten month’s period of notice (nearly nine now). I am going to work up until the 31st March 2019 at which point I will work solely as a self-employed ecologist and entomologist. This feels like the right time in my life to do this, so I’m going to go for it. The last ten years have been an incredible time for me. I have given over a quarter of my life to the role and the 32 reserves and all the thousands of species that live there. 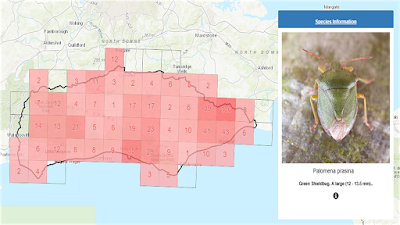 It has been the best job a naturalist could ever hope for, given the freedom to write a monitoring strategy for such fantastic reserves from scratch and then implement it has been a dream come true. Yet nothing lasts forever and I feel a new challenge calling me. With such a complex job, I couldn’t leave mid field season, then all that work takes time to write up so even six month’s was looking like a short period of time to give. So in order to do it justice, I needed the longest run up possible to leave the work I’ve done on the monitoring strategy over the last ten years (well 11 by the time I’ve finished) in the best state possible. 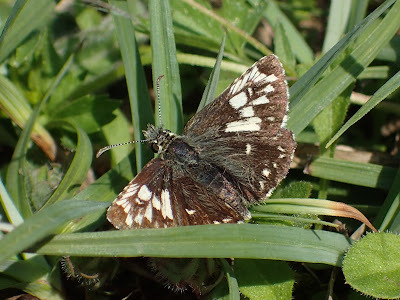 When I do finally leave, I will be strongly linked to the Trust still, remaining in my role of VRM for Ditchling Beacon on the last Sunday of every month and working closely with the SxBRC as county recorder for bugs & spiders and submitting thousands of records every year etc etc. So as of the 1st April 2019 I will be a naturalist for hire based out of Brighton but I'll be posting more about that in the future. I'll keep the blog going throughout though and in the future when I can too. Saying goodbye to those reserves is going to be tough, as hard as saying goodbye to my colleagues even. Today was incredible with a singing Nightjar in broad day light, a Purple Emperor landing in the gazebo and clouds of Silver-studded Blues. Iping is a real gem of a site. So I reckon I have about #300dayswild left as I plan my exit or 'Grexit'. And here is that Purple Emperor, a fitting way to end such a post! Last Friday I ran a course for the first time. An Introduction to Spiders at Iping Common. This fantastic reserve is Sussex's best site for spiders, with 204 species recorded there and a quarter of these having conservation status, it's one of the best places to see spiders in Sussex (along with Rye Harbour). The aim was to show how much can be done in the field and also how much needs to be done at the microscope. The very first spider we recorded on the first Gorse we beat was the nationally scarce Araneus angulatus! All in all we recorded 21 species. Only one of these was identified at the microscope. Tibellus oblongus. Despite taking several very spotty Tibellus, we didn't manage to add Tibellus maritimus to the site list, a useful lesson in how some ID features are only a guide with spdiers. In fact, it's getting really hard to add a new spider to this site! Here are the spiders we saw with the year they were last recorded and their conservation status. That's a whopping 38% of spiders with conservation status! Stars of the show included the jumping spiders and of course Thomisus onustus shown above. We found one adult male and two immature females. It's the male featured in the image above and below. I think it looks like cooling lava against the black heath. This is the female (although this image was taken some years ago of an adult - wow it was over eight years ago now). Well done everyone who attended and help find the spiders, if any course attendees have any photos they would like to share on this post from the day I will gladly do so. It was a great day. But it didn't end with the spiders. We had two species new to Iping Common. Both bugs, being Leptopterna ferrugata and Aradus cinnamomeus. The rare beetle Cryptocephalus biggutatus also showed up in the sweep net. A couple of days ago, Alice and I headed to Marline Valley to assess the meadows and also look for a rare micro moth that feeds on Dyer's Greenweed. We didn't find the Greenweed Flat-body Agonopterix atomella. We did however, find a whole bunch of other quite interesting stuff. 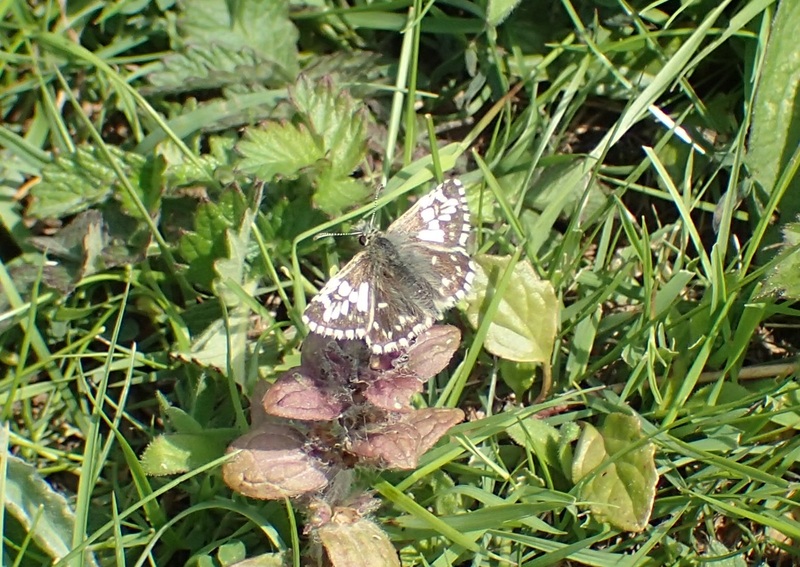 First up, we saw this aberrant Grizzled Skipper (I'm thinking taras but as I have seen very few aberrant butterflies I'm not sure). It wasn't long before we saw another one. Clearly a different animal. 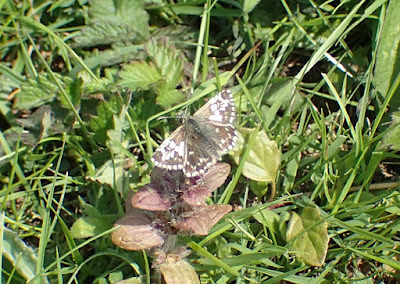 These were the only two Grizzled Skippers we saw all day and it's not a common butterfly at Marline. They have almost certainly come in from a change in sward structure that favours the butterfly. In fact, we recorded at least 20 species new to the reserve. Perhaps the most exciting was a male Long-horned Bee Eucera longicornis on Bramble flowers. This isn't the exact Long-horn Bee but you get the idea. A brilliant thing to find on the site and hot on the heels of Alice's record of them at Pevensey Marshes last week! The highlight for me though was this trio of big brown weevils. Tanymecus palliatus looks like a large Sitona and we picked two of these up in the suction sampler. It's a Nb species that's already known from the site and is not common in Sussex. This is Attactagenus plumbeus. Another Nb species with a 'dot-dash' Morse code pattern on its back. It's a new record for our reserve network! And this one is a bit of an oddity. 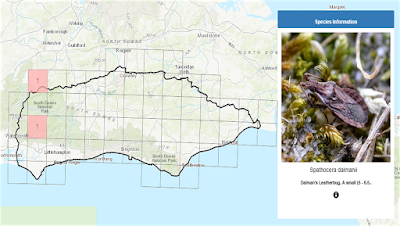 It's also a new record for the reserve network but is not nationally scarce. 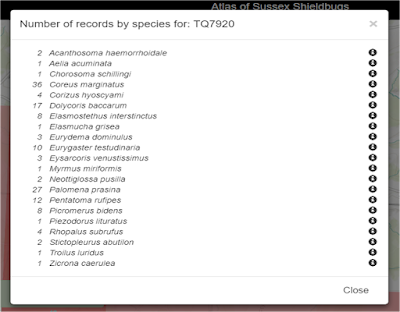 It's on the Sussex Rare Species Inventory though. I was only thinking about this as I found one of these years ago soon after I started beetling in 2010 but for one reason or another it didn't get recorded. In the last eight years I have not seen another one. It's Graptus triguttatus. Strange how this happens. Despite much searching, we didn't find any other Dyer's Greenweed specialist other than the mirid Heterocordylus genistae. This was present on every patch, even the single isolated patch in Lower Meadow. A great day in all. The meadows were looking great. Well managed as ever and with little Bramble and scrub due to the 'little and often' approach of cutting carried out by the volunteers.